China declared the second quarter performance. The summary data points are presented in charts. The impression continues to be that China has maintained its high growth and there are no indications of a crash landing. China’s economic growth rate is decelerating, and many officials and analysts believe the moderation is healthy and will not lead to a hard landing. Gross domestic product (GDP) rose by 9.5 percent year-on-year in the second quarter of 2011, tapering off slightly from the 9.7-percent growth posted in the first quarter and 9.8 percent in the fourth quarter of last year. 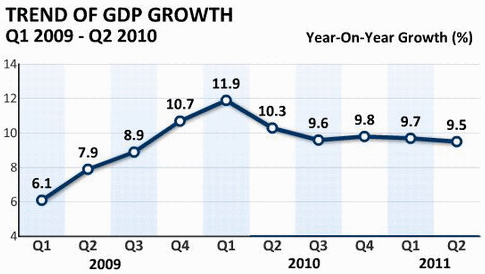 GDP reached 20.45 trillion yuan (3.15 trillion U.S. dollars) in the first six months, up 9.6 percent year-on-year. China’s inflation escalated to the highest level in three years amid lingering pressure, with the consumer price index (CPI), the main gauge of inflation, jumping 6.4 percent year-on-year in June. The June inflation rate accelerated 0.9 percentage points from May’s 5.5 percent which stood at a 34-month high, both far exceeding the government’s annual inflation control target of 4 percent. Of the 6.4-percent CPI growth in June, 3.7 percentage points were contributed by the carryover effect of price increases last year. China’s industrial value-added output grew 14.3 percent year-on-year in the first half of this year.The year-on-year industrial value-added output in June stood at 15.1 percent after hitting a seven-month low of 13.3 percent in May. 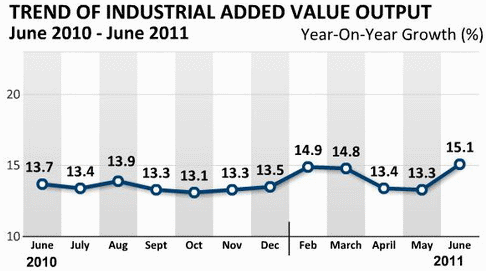 On a monthly basis, the industrial value-added output expanded by 1.48 percent in June from May, compared with 1.03 percent over the May to April period. China’s fixed asset investment rose 25.6 percent year-on-year to 12.46 trillion yuan ($1.93 trillion) in the first half of this year. The growth rate was 0.2 percentage points lower than that during the Jan-May period. 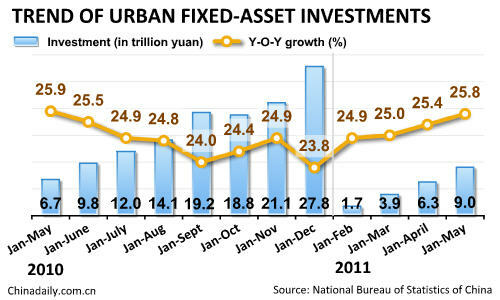 In June, fixed asset investment fell 1.04 percent from May. Investment in the primary, secondary and tertiary industries rose 20.6 percent, 27.1 percent and 24.7 percent from one year earlier, respectively, during the first half. Furthermore, investment in the nation’s property sector rose 32.9 percent year-on-year to reach 2.63 trillion yuan — of which 1.86 trillion yuan went into residential housing, an increase of 36.1 percent from the same period last year. Floor space transactions of commercial housing climbed 12.9 percent year-on-year to 444.19 million square meters during the first half. 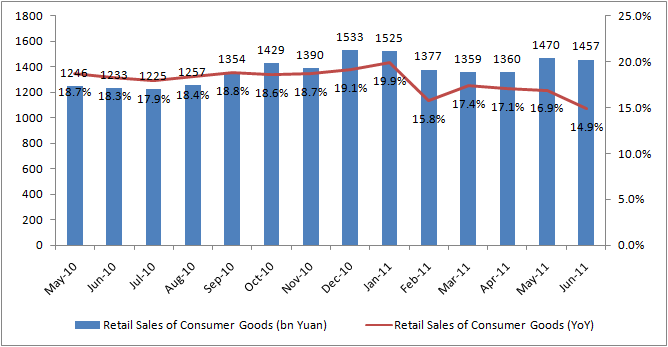 China’s retail sales of consumer goods rose 16.8 percent year-on-year to 8.583 trillion yuan ($1.32 trillion) during the first half of this year. In June, the country’s retail sales grew 17.7 percent from one year earlier and were up 1.38 percent from May. Urban retail sales increased 16.9 percent year-on-year to 7.445 trillion yuan during the first half, while rural retail sales climbed 16.2 percent to 1.138 trillion yuan. The catering sector generated sales of 957.9 billion yuan, a rise of 16.2 percent from a year earlier while commodities retail sales increased 16.9 percent to 7.63 trillion yuan. Auto sales grew by 15 percent during the first half, down 22.1 percentage points from one year earlier. 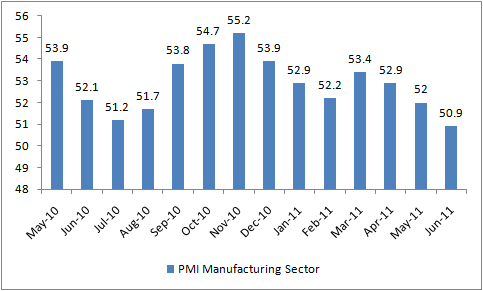 The country’s final official Purchasing Managers’ Index (PMI), an indicator of manufacturing activity, declined to 50.9 in June from 52 in May, signaling a slower growth rate for the world’s second-largest economy. The pace of China’s import growth in June fell to its lowest level in 20 months as tightening monetary policies kicked in, resulting in the biggest monthly trade surplus this year, official statistics show.According to the General Administration of Customs (GAC), imports rose 19.3 percent, from a year earlier, to $139.7 billion, the weakest since November 2009. Exports rose 17.9 percent and despite this being the smallest increase since last December they reached a record high of $161.9 billion. The decline in import growth has led to a widening trade surplus, $22.3 billion in June compared to $13.1 billion in May. But in the first six months the trade surplus dropped 18 percent, year-on-year, to $44.9 billion. 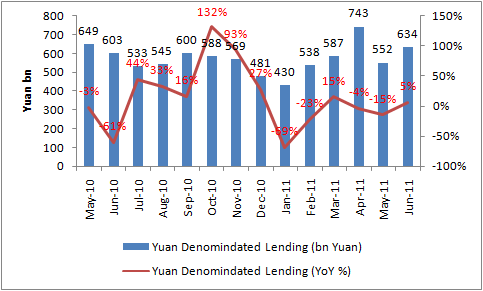 China’s new bank lending rebounded to 633.9 billion yuan ($97.52 billion) in June from May’s 551.6 billion yuan. 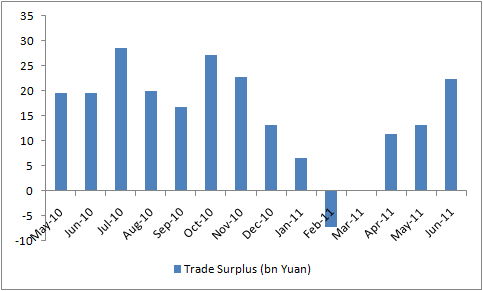 The June figure was also 20.7 billion yuan more than that of last June. By the end of June, the broad money supply (M2), which covers cash in circulation and all deposits, rose 15.9 percent year-on-year to 78.08 trillion yuan. The pace of increase accelerated from May’s 15.1-percent growth but was 3.8 percentage points lower than that of last June. In the first half of this year, the country’s financial institutions granted 4.17 trillion yuan in yuan-denominated loans, 449.7 billion yuan less than the same period of last year. It seems more evident than ever that the Chinese economy is at a critical crossroads, with inflation soaring to the highest level in three years while other economic indicators point to a slowdown in growth. But what should give comfort to policy makers is that part of their plan is working which was to slow down the economy without crashing it. 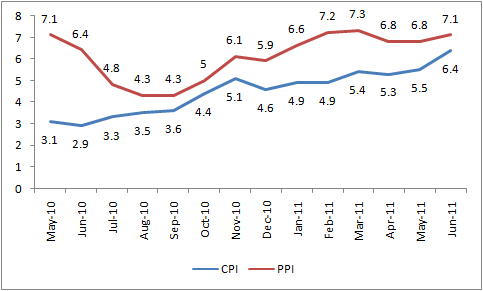 The other half of controlling inflation needs to be now carefully achieved with lending rate at record highs. We continue to view the Chinese economy in a very healthy state albeit slower than before but slower for its own good.